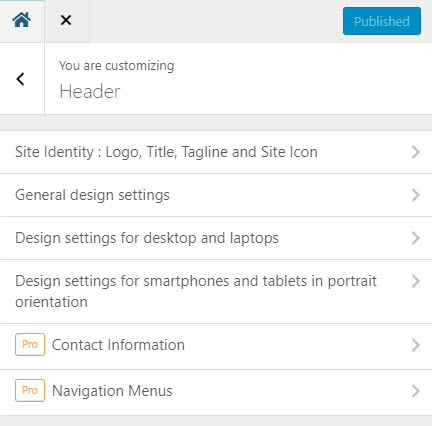 You can customize your header from the live customizer > Header panel. Most of the options have been made self explanatory. The best way to approach your header design is to safely test different layout and design options from the various customizer options. Then once you are happy with your design, simply publish it live. When working on your header, keep in mind that the design on desktop devices will not be the same as the one on mobile devices, due to the dimensions difference. You can preview your website at various widths with the device controls at the bottom of the live customizer panel. How to add a menu to my Customizr website ?